Hello everyone!!! I hope you are having a wonderful week!!! We went to Ryan's basketball game yesterday at 5:00 PM and then belined it to Mackenzie's soccer game at 7:00....I think this old grandma is getting too old for all this excitment...LOL!!! We don't have another game till Friday so we have time to rest up!!! In the meantime...it's Wednesday and time for another Color Throwdown Challenge! 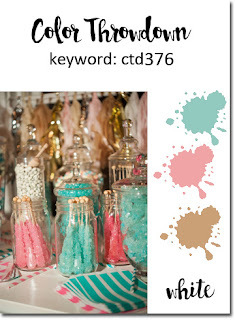 Jodi is our hostess and don't you just love the colors she chose...pink, aqua, kraft, and white...so pretty!!! I have a large box with lots of left over Taylored Expressions diecuts from other projects and for this challenge I decided to dig around and find some diecuts in the challenge colors...after playing around for an hour or two, this is what I came up with. The background designer paper was cut with the Stitched Rectangle Stacklets and the heart, which was embossed with the Swiss Hearts Embossing Folder, was cut out of Sugar Cube cardstock with one of the Hearts Stacklets dies. The Salt Water Taffy frame was cut with one of the Frame in Frame Cutting Plate dies, the flowers were cut with Bloom Where You're Planted dies, the banner was cut with one of the Stitched Banner Stacklets, and the pig was cut and stamped with the Quick Critters Stamp & Die Combo. The sentiment is from the Love Makes the World Go Round stamp set and the twine and wood dots finish it off. 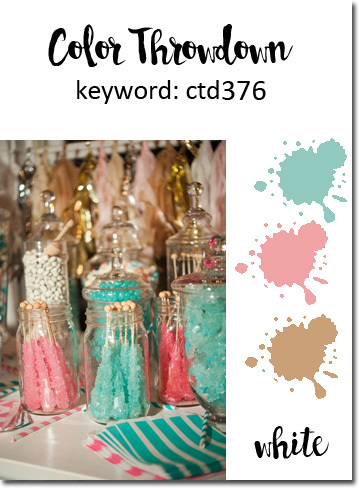 Remember, be sure to add CTD376 to the keywords section when you upload your cards to an online gallery so we can find your creations!! Also, please use #376 and #colorthrowdown on social media sites. Thanks for stopping by...have a super fab day!!!! What a sweet card!! Great Valentine in non-traditional colors! 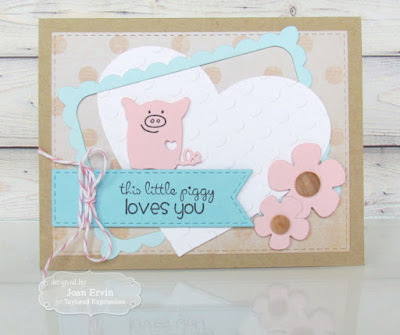 How sweet and cute is that little piggy!!?? I love it! Ack! How CUTE is that little pig!! LOVE this!!! 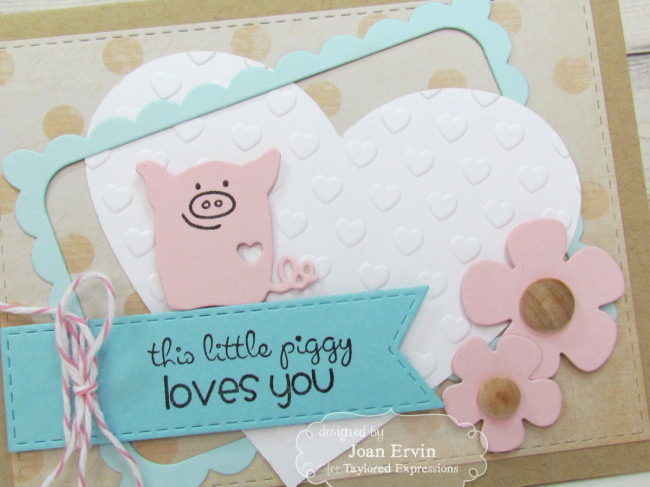 Such an adorable card with a super fun layout! This is just too cute, Joan! Love the layout. And a cute little piggie he is! Darling card!